Those have been aspects of my basic emotional response. We belong here. This football team deserves this (and this success in the end is all about the football players and coaches, as Grandmaster Wang so rightfully and righteously points out). They have worked hard--this year and three years prior. They are talented. They are smart. Many of them, especially the player leadership, seem very committed to the good of New Orleans. In sum, although this is a new experience for us and me based on history, I should not be shocked that we are here. Again, we belong here. Let's get used to this. Let's not settle for less than first place. Let's not settle for less than world class. We settled for allegedly Category 3 levee protection, levees that were horribly designed and built. Look at what that got us. We settled for Edwin Edwards, who was effective but corrupt. Look what that got us. We settled for Ray Nagin, who made the right businessman noises but was untested and (ultimately) unstable. Look what that got us. We settled for lower-cost, slab-on-grade housing in New Orleans East (a wetland) and elsewhere, and look what that got us. We settled for abandoning and ignoring the public schools, and many sent their kids to private and Catholic schools with "good enough" reputations. Look what that got us. I've said this before: I love the Saints. I love Saints' fans even more. But if we enjoy the football and the parties, and then go back to doing things the way we've always done them, it's all just bread and circuses. I've been hearing "This is not your father's Saints." Thank goodness. I want to start hearing "This is not your father's New Orleans." "People have taken us more than once. We should stand up more than anybody else and say, 'We'll take 500, we'll take 1,000.' I'm not hearing that from anybody in Louisiana and last year we evacuated our vulnerable population twice," said Honore, who commanded Joint Task Force Katrina. This is dead right and so obvious, and I haven't even thought of it once. I've been almost silent about Haiti because I can't get my mind around it and what I can do about it, other than send money. However, if getting people out of there for awhile, or for a lifetime if that is what is best, will help, then General Honore is right. And Louisiana should take the lead. I would hope Governor Jindal would second this and then actually do something about it. My second-favorite thing about what General Honore says is that he uses the first person plural--"us" and "we" and "our." During the last evacuation, he was living in Atlanta, and as a career military man he lived all over the world. But at heart he is a Louisiana guy, and now he and Mrs. Honore have moved back home and live in Baton Rouge. 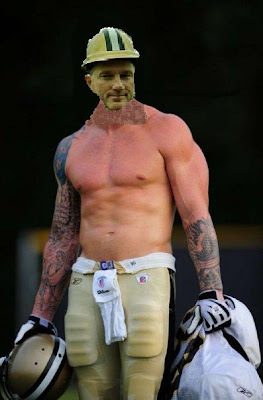 Berto Has Been Working Out to Prepare for the NFC Championship. This song (and this version of this song) is reassurance to me that there are larger powers at work in the Cosmos. Saints vs. Vikes: Snakes. Why Does It Always Have to be Snakes? 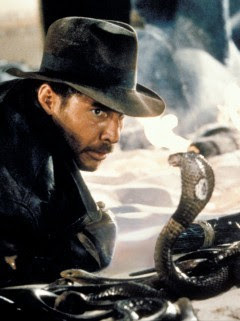 Hey, Indiana Jones stared down the snakes. We've already vanquished the reigning NFC champs. Now it's time to beat the Nemesis. Remember Daunte Culpeper and Grady Jackson's big flop. Remember 44-10. Remember playing a playoff game in Minneapolis with, like, no running backs. Remember last year, when we wasted Reggie's two beautiful punt return TDs. This is our time. This is OUR time. This is an appeal to Saints fans. Berto, Fleur D Licious, others, and I were troubled by the performance that occurred in the Superdome against the Dallas Cowboys on December 19. I'm not talking about Our New Orleans Saints' performance that day. I'm talking about the fans' performance. People seemed quiet--and got quieter still when the Cowboys took an early lead. By early in the 4th quarter, I actually saw empy seats in the Club level. The next day, my ears weren't ringing the way the usually are after a big game. My theory: people were so excited that day and had spent so much time and energy drinking and carousing all day in the streets, that they had little left for the ACTUAL FOOTBALL GAME that was to be played that night. The Saints lost, and perhaps we got what we deserved. So let's all commit ourselves for this playoff game. Enjoy our beautiful city before the game. Eat, drink, be merry outside. But save plenty of noise and liver capacity for inside the Superdome. Our New Orleans Saints need us at our world class best. Mr. Willie Jackson. 3 touchdown catches in the Saints first playoff win ever, against the St. Louis Rams on December 30, 2000. I'd never make it as Saints coach, because Willie Jackson would STILL have a spot on the roster if I were in charge. I never would have been able to cut the guy. Beautiful day, indeed. And who was the quarterback on the losing team that day? Kurt Warner. Yes, the Saints' web people know what they're doing by reminding us all of this. Okay, I'm going to get a little wacky about karma and such. I'm a little uncomfortable doing this, but I think it must be done. Please ignore this if you're not into such speculation (and note that I don't do this kind of thing much because I'm so bad at at, and it has backfired on me many times in the past). The Saints have lost three straight games because it had to happen, given the emotional/spiritual dynamics that were starting to stir, on the team and among Saints fans and in the city of New Orleans and on the Gulf Coast. Simply put, in order to achieve the goal we all want--the Lombardi Trophy--we "needed" these losses, because most of us were getting cocky and feeling a sense of magic and destiny. Dangerous stuff, "magic" and "destiny." We shouldn't think of such things. This is not to say that the team threw the games on purpose. Of course not. I'm just saying that built into the growing sense of power and destiny we were all feeling were the seeds of trouble. Now that we have looked at ourselves and found ourselves quite human and quite capable of losses and silly pride, we can buck up and move on to great things (or at least hard work). I wrote (and had published in the New Orleans and Dallas newspapers) letters to the editor noting some poor behavior by Saints fans at the Dallas game. In some cases, Saints fans resembled Bears fans at the January 2007 NFC Championship Game (well, maybe not that obnoxious, but still pretty bad). After the loss to the Bucs, Charles Grant (okay, it's Charles Grant, but still . . .) reported that Saints fans were booing the team as they left the field. I was at the game. I was as disappointed as anyone, but I didn't think the Saints' efforts were boo-worthy. We lost in overtime. We were 13-2 at the time. As 2010 and the playoffs begin, let's focus on the cleansing that just went on. We and our team were humbled. In 2005, our whole city and region were humbled. One response to this is to take the entitled approach to it all. You may have seen this (or even done it--I'm sure I have): "I paid my money. I put in some effort. If I don't get the result I want, then screw it and screw you. I'm picking up my toys and going home to pout and to criticize and to blame others that I didn't get the result I wanted." When most people talk about an attitude of entitlement, they are criticizing "lazy" people who expect things (welfare payments, whatever) for doing nothing. A far more damaging and insidious attitude of entitlement exists in those who put in some effort or spend some money, and then expect perfect results--or results that far exceed the effort or money put into the process. The booing fans at the Bucs game, the abusive fans at the Dallas game--that came from a sense of entitlement. "I bought my ticket. I deserve to have my inflated expectations fulfilled!!!" Now I am hearing rumors that since the big win over the Patriots, a significant group of Saints players are spending very late hours (till 4:00 a.m.) in the French Quarter. Again, a sense of entitlement. "I put in my hours. I've played hard. I deserve this, and I can do it and still get the excellent results I've gotten up to now." We can't be guaranteed any results--for the Saints, for our city, for our region. At its best, New Orleans and its residents know this. We know that we can only work hard, have fun, and care for one another along the way. We are guaranteed nothing. So let's work hard in January and in 2010, and let's have fun, and let's care for one another, and let's see what the playoffs bring.